Oh, it’s a technical quibble, I know. Henry Wallace campaign button, probably from 1948. R. Emmett Tyrell worries unnecessarily that Henry Wallace might have been president, had FDR died a few months earlier. I’ve read R. Emmett Tyrell for years. Back in the day, when American Spectator was scratching to get anyone to read, they sent me free copies — I presume because they got my name off of a list for National Review. At some point they decided they could actually get someone to pay for the magazine, and I fell off their list. And I’m sure that, had he thought about it for three minutes, he wouldn’t have written it. But Tyrell didn’t think. Progressives have long been in favor of One World vouchsafed by the United Nations. Henry Wallace, Franklin Delano Roosevelt’s second vice president and the 1948 presidential candidate for the Progressive Party, spoke of it often. On the campaign trail in 1948 he spoke of “jobs, peace, and freedom” that “can be attained together and make possible One World, prosperous and free, within our lifetime.” He too promised to coordinate policy through the United Nations. Had President Roosevelt died but six months earlier, America would have had this fantastico in the White House. As it was, in one last act of cunning for his country, Roosevelt maneuvered Wallace out of the vice presidency and Harry Truman in. Harry was green but he was not naïve. We came that close to Henry Wallace and his “Gideon’s Army” in the White House. Does Tyrell really believe that? Henry Wallace could not have succeeded to the presidency at any time after noon, January 21, 1945, and had he succeeded to the presidency any time before January 21, he’d have served only until January 21. Had Roosevelt died any time after November 7, 1944, Harry S Truman would have been inaugurated on January 21, 1945. 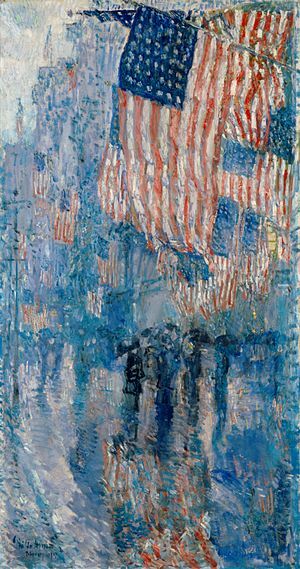 Had Roosevelt died between the Democratic Convention and the election, one could make an argument that Truman would not have won the nomination nor the presidency — we’ve never had a candidate die before election day, nor between election and inauguration (though William Henry Harrison sure pushed it). Berryman cartoon, probably from the Washington Star, 1948 — New York Gov. 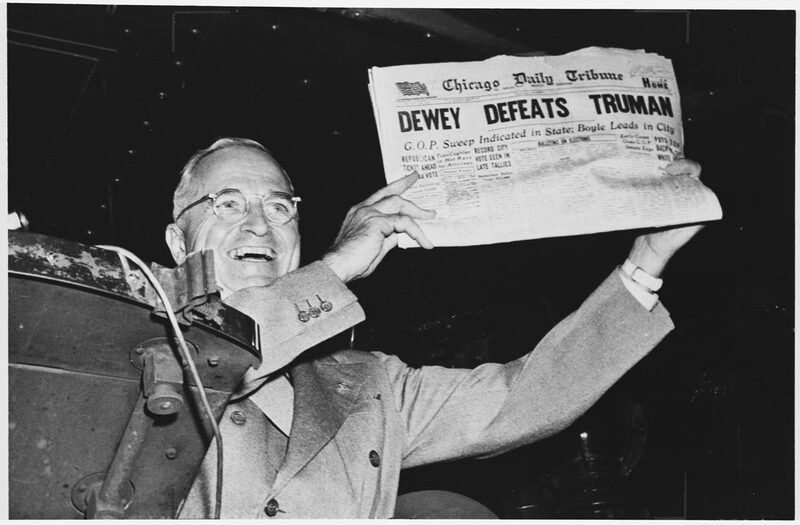 Thomas Dewey was expected to handily defeat President Harry S Truman; the election was held anyway. Elections have consequences. Roosevelt died on April 12, 1945. Six months earlier quickly calculated would have been October 12. [I goofed when I submitted a comment at the Spectator site, and calculated December — too quick a calculation!] Wallace, then the vice president to FDR, almost certainly would not have won the Democrats’ nomination for president. It may have been possible for the party to name a new ticket, and if so, it would not have had Wallace on top. One can make a case that Truman wouldn’t have been on top of a new ticket, either — but even October 12 may have been too late to change the ballot, for pragmatic purposes, prior to the election. Most discussions I’ve seen suggest that the vice presidential candidate would be moved up in such a case. So, had Roosevelt died months prior to April 12, 1945, we would have had Henry Wallace as president for only a few weeks, until inauguration day the next January. Then we would have had Harry S Truman, or Thomas E. Dewey. Dewey ran against Truman in 1948, and lost. There’s a good case to be made that Truman would have defeated Dewey in 1944, had they run against each other then. Truman would have had the sympathy vote, and he would have been thought to have been the heir to the Roosevelt legacy and policies near the end of World War II. With Hitler and Tojo on the run, it would have been a bad time to switch parties and policies. We’ll never know, but Tyrell need not worry.